Our customer service answers the phone. Try it. Give us a call at 888-859-9219. No auto-attendants, no computer voices asking you what you want. Just one of our Customer Service team members, sitting in the United States, working with you to answer your questions, resolve an issue, or help you through a challenge. 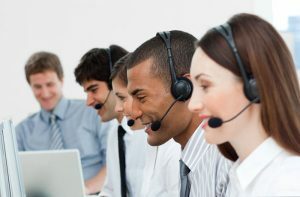 You don’t even have to say “representative” or carefully pronounce “cust-o-mer ser-vice.” Well, you can, but the live person on the phone might share a chuckle with you. When you first sign on with EPS, one of our customer service team members will walk through your contract with you, covering every detail, answering every question you may have. When we’re done, you’ll understand, in as much depth as you want, your contract term, provisions, and options, and you’ll have the right expectations for what you’ll see on your first statement. When you get your first statement, call us. (You can also call us when you get any statement.) We’ll help you understand every line item that’s on it. Statements and contracts are the two biggest opportunities for confusion, and we’re here to do everything we can to keep you un-confused and very clear about what you’re paying for, how much you’re paying, and what, if any, changes you might want to make in how you’re handling payments. One of our team members would be glad to review a statement from your current credit card processor with you. There may be opportunities for improvement, and we’ll help you identify them. You can use that information to negotiate a better deal with your current provider or to make the decision to switch providers. It’s totally up to you. Start the process here. If you’re already accepting credit cards, and you’ve decided to become an EPS customer, we’ll help you get everything transitioned properly. There’s nothing worse than switching providers but forgetting some detail that causes you to get another statement from your old provider. We have a process, and we’ll get you through every step of your switch-over with minimal disruption to your business. You can read more about switching providers here. If you need to swipe credit cards, and the swiper breaks, it’s a problem. What do you do? Pick up the phone and call us. Our terminal warranty is second to none. We’re going to get a new terminal out to you asap. We’re also going to get you set up immediately to accept payments another way so you can keep selling. It’s what we do.